Home / WHY HOT MOP? Tile and grout have pores. When you take a shower, most of the water runs down the drain. Whatever water or moisture is absorbed by the tile and grout is caught by the shower pan, and sent down weep holes in the drain. All of this happens below your tile shower where you cannot see. That is why it is so important to have a water tight membrane below your tile. excellence in tile installation, recommends the hot mop shower pan method over other methods such as a vinyl shower pan liner. A prefabricated shower pan membrane provides inadequate protection against waterproofing in the long run. You should trust the quality and reliability of a hot mop shower pan over any type of waterproof membrane. 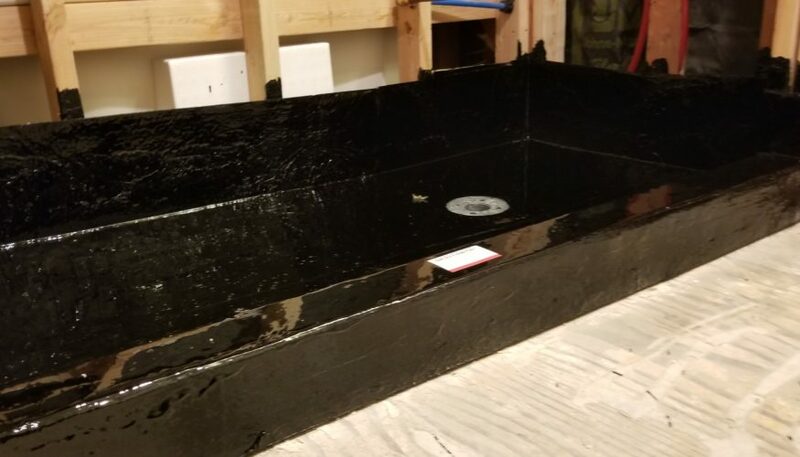 A shower liner can puncture much more easily than a hot mop shower pan which is made from liquid heated tar and three layers of roofing grade felt. The heated tar is applied to the shower pan and fully seals, waterproofs, and protects much better than a shower pan liner. What are the main problems with vinyl shower liners? A leaking shower pan can cause a great deal of damage to one’s home or property. Not only the tile work needs to be demolished, water damage to your personal property can cause a big headache. It is for this reason that majority of veteran contractors choose a hot mop shower pan over a shower pan liner. Always choose a hot mop shower pan over a vinyl liner.